We’re pretty much all in agreement that spaying and neutering is a good thing, but not everyone’s 100% sure as to when it can, or should, be done. Some vets recommend doing it between four and six months old, while others say between five and nine months old. There are also those who think neutering your cockapoo after he has reached puberty has long-term health benefits. Neutering your male pup before he hits his “teens” could prevent some bad habits, like aggression and marking. For female cockapoos, some recommend spaying before their first heat, which can be as early as five months old. This reduces the chance of mammary tumours, but there is evidence to show that females spayed after their first have a lower risk than unspayed pups. If you’re unsure, you can ask your vet, who will be happy to give you all the information you need. There are a lot of reasons why spaying or neutering your cockapoo is a good idea. Let’s take a look at why, as a responsible pet owner, you should consider getting it done. It’s estimated that between 5 and 8 million animals are euthanized in the States every year. By spaying or neutering your cockapoo, you can help prevent unwanted litters and reduce the number of shelter killings. Spaying your cockapoo reduces the risks of breast cancer as well as uterine infections. It is often recommended to do this before her first heat. Neutering your male cockapoo will not only stop unwanted litters, but it’ll also prevent testicular cancer. A cockapoo that isn’t neutered will do pretty much anything to find a partner, whether it’s digging a hole under the fence, scaling the wall or pulling a Houdini. And once he’s out, he could get run over, or get into a fight with another male. Neutering your cockapoo won’t change his personality, but it could prevent a few bad habits developing, like him marking his territory, or being aggressive. Bad behaviour can be avoided by giving him the snip early on. There are a few myths and misunderstandings that stop people from neutering or spaying their cockapoo. We’re not sure when and how they came about, but it’s time we bust them. No, it won’t make your cockapoo fat and lazy; too much food and not enough exercise will do that. As long as you keep up the walks and regular outings and maintain a healthy diet, your pooch will stay thin and trim. Um, no! Female dogs can be ready to produce from around four months old, while males can father puppies as early as six months of age. 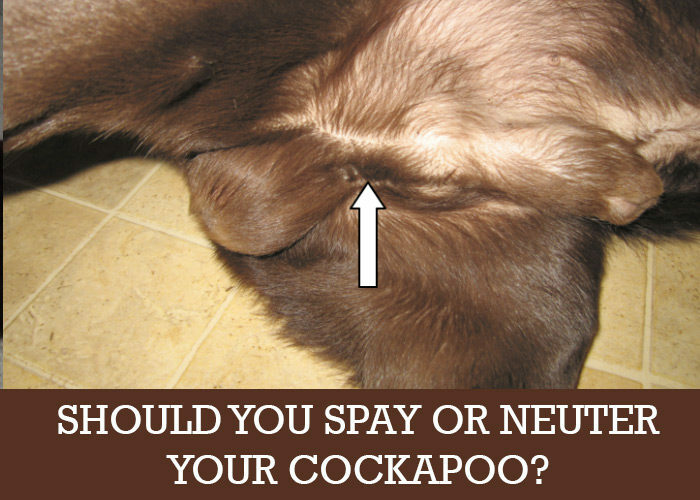 Your vet will recommend that you spay or neuter your pup anywhere between six and nine months old. It’s no worse than any other surgery. The procedure is done under general anaesthesia you’re your pooch won’t feel a thing. There’s a chance he or she might experience some discomfort after the op, but most dogs recover quickly with the correct post-operative care. Trust us, shelters have as many thoroughbreds as they do crossbreeds, and there just aren’t enough families to adopt them. Owning a purebred or a particular mix breed, like a cockapoo, isn’t a license to breed. Yes, that may be the case but there’s no guarantee they won’t get out, and in the process get pregnant or wander off in search of a female on heat. Admit it, it’s a pretty feeble excuse to not neuter or spay your cockapoo. Instead, teach your children about being a responsible pet owner. Spaying or neutering your cockapoo as per your vet’s recommendation will make you a part of the solution, rather than contributing to the millions of strays that end up in rescue shelters every year. For us, being a responsible pet owner doesn’t only mean feeding and exercising your pooch, it also means taking care of their best interests. 10 foods NOT to give your Cockapoo. Why Is My Cockapoo Growling? Bananas anyone? 10 great foods for your Cockapoo. Best Ear Cleaner for My Cockapoo?